SP Brewery continues to show support towards Sports in the country and today they presented K400, 000 to PNGNRL showing their commitment to continue its support towards the 2016 Digicel Cup. Managing Director Mr Stan Joyce says that South Pacific Brewery was like a parent to the competition nurturing it to where it is today while he commended Digicel PNG for taking the competition to the level it is today. 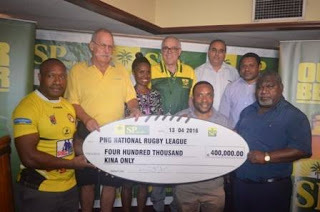 Mr Joyce stressed that this sponsorship is more about maintaining relationships and working with the community through partners to develop the game.